As Phil previously noted, Kerbal Space Program will enter beta with its next patch, the not-too-far-from-release-surely update 0.90.0. At the time, we didn't know what this first beta version would comprise, exactly, but now we do, because developers Squad have released a big video detailing exactly that. As the four-minute-long trailer explains, we'll soon be able to upgrade facilities, level up Kerbals, and take advantage of an "overhauled" editor, which does look slightly less intimidating than the old one. That's in addition to a load of other stuff, some of which has drawn from player mods (with their creators' permission and involvement, obviously). 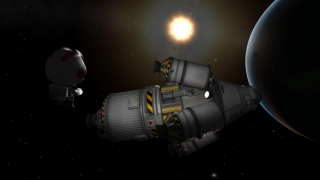 'Beta' is a word that means different things to different people, but Squad see it as the point at which Kerbal Space Program contains the minimum amount of stuff necessary for it to be worthy of the name. They're going to keep adding stuff during the beta, and even after release, including the long-promised multiplayer elements. The video above is just a glimpse what the game will look like soon, when 0.90.0 touches down on planet Earth.